In the notes left by Sr. Mary of the Trinity, it was written that our Lord is calling for a multitude of “victim souls” who will imitate Him in the Apostolate of His Eucharistic life. He specified to Sr. Mary that these souls will be from all walks of life, including laity and not only priests and nuns. About fifty years after Sr. Mary received her messages from our Lord, Jesus came again and spoke to an American laywoman, Therese. 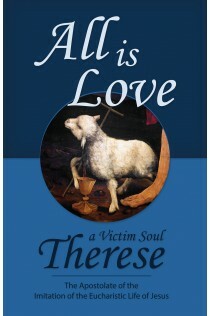 She had made the Vow of Victim to imitate His Eucharistic life. All is Love is a compilation of these spiritual insights from 1993 through 1996, published here for the first time. Simple and profound, sweet and challenging, the messages call everyone to a greater degree of holiness. I call to you to enter into My service of love. It is a service to save souls...multitudes of souls. All through love and humility. My enemy will be confounded. “Come, join Me in My Eucharistic Life. Imitate Me. Do not be afraid. I call to you, My children.